"I've been called a lot of other things along the way. Things your mother would wash your mouth out with soap for saying. If your mother was a washing kind of lady, that is." The below list of links will be growing as I add more links to other websites I like. The list is in 2 parts: (1) Links - Writing & Books, and (2) Links - Other. Copyright Note: The logos reproduced here have been taken from the Web and are used in the spirit of promoting the respective organisations or websites. The copyright for the logos remains with their owners. 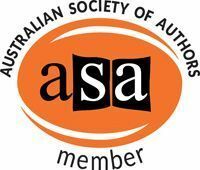 I'm proud to be a member of the ASA and thoroughly support their advocacy for all Australian authors. I've attended numerous writing courses and workshops here over the years, all of which has helped immensely on my path to writing. If, like me, you're a massive fan of the Private Eye genre of crime fiction, you MUST visit Kevin Burton Smith's truly awesome website. It is by far the most comprehensive collection I've ever encountered of everything to do with PIs and their like. As Kevin himself describes it - "Everything you ever wanted to know about Private Eyes and other tough guys...and gals". The site is based primarily around the actual characters, and there are literally hundreds of them. And he doesn't just cover novels and short stories, but also film, TV, radio, comics, and more. You could literally spend weeks just reading his website, and I've certainly discovered lots more great reading from it. In my humble opinion, you're not a PI fan until you've been to The Thrilling Detective Website. Keep up the fantastic work, Kevin! 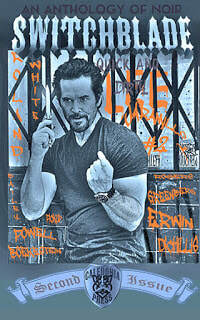 Switchblade magazine, out of the US, is an anthology of hard-boiled and noir short crime writing. There have been 2 issues so far, and I'm particularly looking forward to Issue 3 as my first Harry short story has been selected for publication. I've really loved the first two issues, and as always with anthologies I've been really excited by discovering other authors. The editor is Scotch Rutherford, and he is doing a really great job with this magazine. It's available on Amazon and I highly recommend it for all those with a love of hard-boiled and noir. In doing the research for my own Cops Writing Crime page, I came across this massive resource from the US. My own page is limited to crime fiction written by cops and ex-cops, but the Police Writers website encompasses all "police writers" they have come across - fiction, non-fiction, true crime, memoirs, etc. 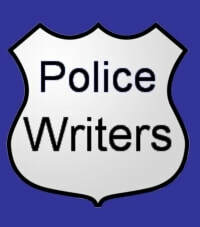 There are over 1200 "police writers" listed, although only about 30 or so are from outside the US. It certainly shows just how many law enforcement professional do pick up a pen! When I decided to self-publish my first novel, Harry's World, I went in search of services to assist me getting my book into print. Queensland-based PUBLICIOUS were just what I was after, and so I contracted them do arrange the printing of Harry's World, along with ebook conversion, typesetting, print-on-demand, etc. They have a range of other services as well, depending on what you want done. Andy McDermott and his team were simply sensational to work with, and I will very shortly be getting them to take on my second book, Harry's Quest. If you're looking to self-publish, then I highly recommend PUBLICISES. Many people I've spoken to have remarked how much they liked the cover work on Harry's World. Well, that great design work is down to Luke Beaton and his team at SAILOR STUDIO. I've often read as I've become an author that if you're planning on self-publishing, never try and design your own cover. Good advice! I've seen some appalling covers out there in the self-published world. I certainly had some conceptual ideas when I briefed Luke for the cover of Harry's World, and then he produced the wonderful end result. His team is currently finalizing the cover for Harry's Quest. So if you're going to self-publish, do consider spending the money of a professional designer to do your cover. The creative man at DYLUNIO is a personal friend of mine, Stephen Hill. He's also a great graphic designer! When getting established as a self-published author, and wanting to do a thoroughly professional job on one's author profile, then it's amazing how many things need graphic design work. And, as for your book cover, unless you are a designer as well as a writer, then don't tackle your won design work - it will be a false economy. I've had DYLUNIO do my author logo, business cards, author stationery, advertizing posters, and we are currently completing a project to create a set of Harry inspired bookmarks. As a basic human right, every person on the planet should be able to get medical care when they need it. I have always admired and respected the work that MSF does around the world helping those most in medical need. And I love the fact that they do so with no political or religious affiliations and associated agendas. So I have been financial supporter for many years now. Do have a look at the great work they do and consider becoming a supporter yourself. "And my old gut instinct was seldom wrong. Not that I'd always listened attentively. My personal life bore a painful testament to that."